Sub: Disbursement of salary for the month of April 2018 to all offices of Andhra Pradesh Circel on 27.04.2018 due to Banks holiday on 28.04.2018 being 4th Saturday and 29.04.2018, 30.04.2018 being Sunday and Holiday respectively – reg. I am directed by the Competent Authority to intimate that the salary (both Departmental and GDS) will be disbursed to all officers of Andhra Pradesh Circle on 27.04.2018 instead of 28.04.2018 / 30.04.2018 due to closing of banking services on 28.04.2018 being 4th Saturday and 30.04.2018 being holiday on the occasion of Buddha Purnima. This is for kind information and taking necessary action accordingly. 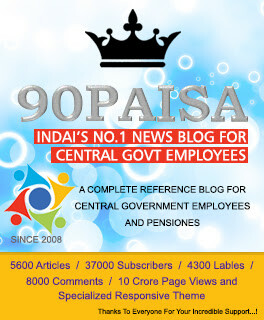 O/o CPMG, A.P.Circle, Vijayawada – 520 013. Ministry/Department of ………………………………………..(as the case may be).I have also not obtained and do not wish to obtain a CGHS Card for availing outdoor facilities under CGHS/Corresponding Health Scheme of other Ministries/Departments from any dispensary situated in an adjoining area. 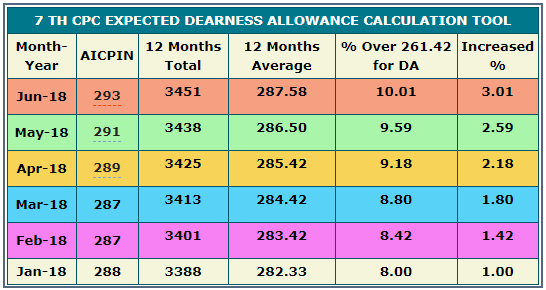 Consequent upon grant of another instalment of Dearness Allowance with effect from 1st January, 2018 to the Central Government Employees vide Government of India, Ministry of Finance, Department of Expenditure’s O.M. No.1/1/2018-E-II(B) dated 15.03.2018, duly endorsed vide this Department’s letters No. 8-1/2016-PAP dated 19.03.2018 and Ministry of Finance, Department of Expenditure OM No.1/3/2008-E.II(B) dated 28.03.2018, the Gramin Dak Sevaks (GDS) have also become entitled to the payment of Dearness Allowances on basic TRCA at the same rates as applicable to Central Government Employees with effect from 01.01.2018. 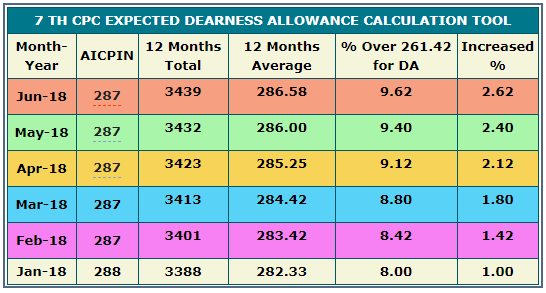 It has, therefore, been decided that the Dearness Allowance payable to the Gramin Dak Sevaks shall be enhanced from the existing rate of 139% to 142% on the basic Time Related Continuity Allowance, with effect from the 1st January, 2018. 9.PAY MATRIX FOR LEVEL‐ 14 MAY BE CHECKED WITH REFERENCE T0 REVISED PAY MATRIX IN TERMS OF DEPTT.OF PENSION & PENSIONERS WELFARE OM DATED- 13.09.2017. Check your pay and allowances as per the recommendations of 7th Pay Commission with our exclusive calculator. 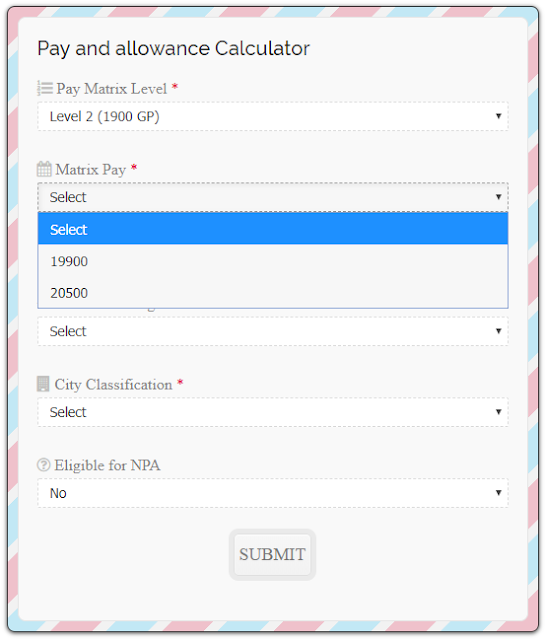 We provided here a simple and elegant calculator to calculate your monthly pay including dearness allowance, transport allowance, house rent allowance and NPA. 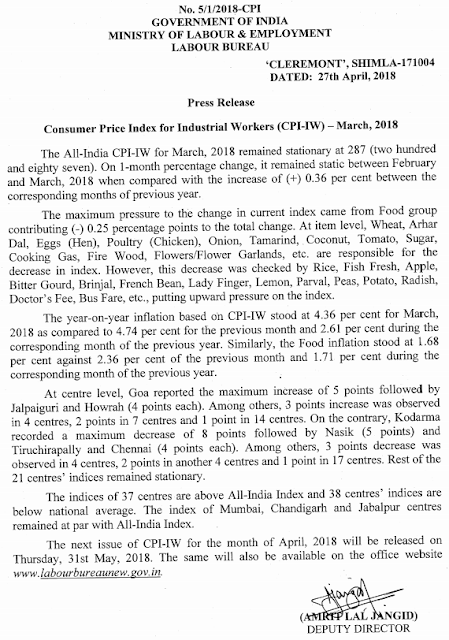 The increase in pay and allowances and pension on account of the revision of scales of pay shall be payable in cash with effect from 1st April 2018. 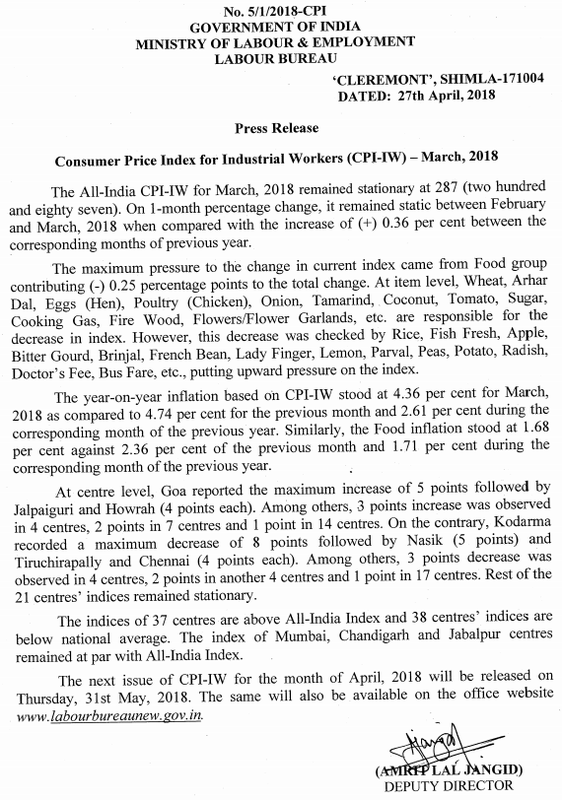 The revised scales of pay are linked to the cost of living situation represented by the index average of 276.9 points as on 1st July 2017 in the All India Average Consumer Price Index Numbers for Industrial Workers (General) (Base: 2001=100). The revised pay scales are specific segments of Master scale of pay of Rs.17000-400-18600-450-20400-500-22400-550-24600-600-27000-650-29600-750-32600-850-36000-950-39800-1100-46400-1250-53900-1450-62600-1650-72500-1900-83900-2200-97100-2500-112100-2800-128900-3100-150600. The scale of pay applicable to any post, as from 1st July 2017, shall be the revised scale of pay specified in column (3) of paragraph 2.1 above as shownagainst the existing scale of pay applicable thereto as specified in column (2). The Special Allowance of Rs.450/-, 400/- and Rs.500/- sanctioned to Primary School Teachers, High School Teachers and Pre-University College Lecturers respectively shall be merged with the basic pay of teachers drawing pay in the respective pay scales applicable and shall be as specified in the following paragraph 4.3. The respective Government Orders governing the grant of the Special Allowance of Rs.450/-, 400/- and Rs.500/- in respect of Primary School Teachers, High School Teachers and Pre-University College Lecturers as the case may be are hereby rescinded with effect from 1st April 2018. 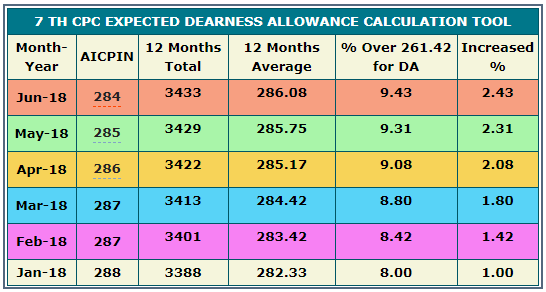 So, what is the Dearness Allowance for the second term of 2018, July to December 2018, likely to be? This time too, it is not expected to exceed 3 percent. Air India LTC 80 Scheme: A new and revised fare list has been published with effect from 1st April 2018 by Air India.